Mopardh9 and DUN24 like this. Setting up to be a great finish here. Not a golf fan, but nothing else is on. Why do so many fans run and surround the ball when it goes into the rough? Try to get on TV, get video, up close view etc. Koepka puts me to sleep. Does this guy have any fans? It's bad enough he went to FSU. Koepka is the biggest disappearing act in golf. Dude is about to have 3 majors and besides has only one other pga tour win. Strangest thing. He's the guy who diehard NASCAR fans think Kyle Larson is...doesn't really care about golf. Think he said he'd rather be doing baseball or something. Only showing up in majors makes sense in that context. That was fun to watch. Good to see Tiger play well. Did not expect such a hot take in a golf thread. Anyways, I watched the finish, good to see Tiger doing so well. AdoubleU24, Michfan, Mopardh9 and 1 other person like this. It's an awesome win --- less than 2 years after fusion surgery on his spine. Greatest comeback in sports history. And I'll say it, everyone wants to use Jack's 18 majors as the measuring stick for greatness in golf - that's outdated thinking. This is it now. 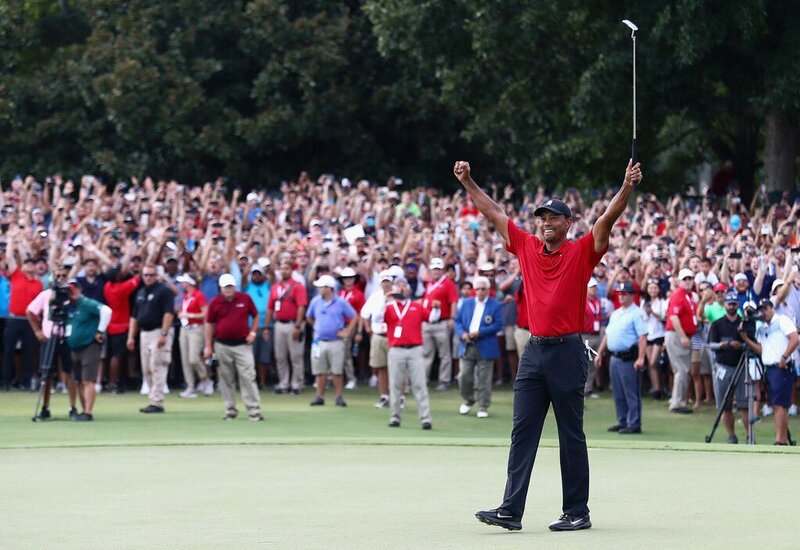 Tiger officially put a stamp on being the greatest of all time Sunday. This man has had multiple major surgeries on his body, and each time he had to basically re-teach himself how to swing a golf club and re-train those muscles to work in that manner. He couldn't even chip a year ago. He hit rock bottom in his personal life for a 2nd time last year, not that this has any affect on his physical ability, but mentally the guy has dealt with his fair share of troubles over the years and that alone would undo most. He climbed from 1199th in the world to 13th in 1 season, he nearly won 2 majors and 3-4 other tournaments throughout the course of the season. And oh yeah, he finished 2nd in the FedEx Cup standings by literally inches. Great to see Rickie close the deal and win the WM Open today. Always a solid field and great atmosphere at Scottsdale. That was an outstanding finish . The shot out of the church pews on 18 was awesome. Glad to see Rickie get that AZ WM monkey off his back.This has always been one of my favorite tournaments. Now that was the darkest finish I have ever seen at Pebble yesterday. Going to finish the last few holes today 11a.m. EST. Phil is up by 3. Good to see Lucas Glover back in the top part of the leader board. they said 2013, that's been a while. FLRacingFan and Michfan like this. Whoever thought an eggsalad sandwich would be a good combo with beer? Rainy spring weather should play a role this weekend at some point. ESPN will also be broadcasting SportsCenter live from Augusta throughout the week. Took off the next 2 days for The Masters lol. Ready to go! Turtle84, AdoubleU24 and FLRacingFan like this. Super tight at the top of the leaderboard. Setting up for a great weekend! Turtle84 and AdoubleU24 like this. Sunday has the potential to be the biggest day for golf in years. Gonna be an early one! Hotrod and AdoubleU24 like this. This is absolutely nuts. So tight at the top. Hotrod, AdoubleU24, Turtle84 and 1 other person like this. Outrageous logjam for this thing. Chewing on 2 sticks of Big Red in support of El Tigray. Hotrod, AdoubleU24 and FLRacingFan like this. Hotrod, AdoubleU24, FLRacingFan and 1 other person like this. Tiger HAS to do this, he just HAS to. AdoubleU24, FLRacingFan and Turtle84 like this. This is crazy. I can’t think of the nascar equivalent of this happening. It’s gotta be when Jeff Gordon won the 2014 Brickyard. Or if Gordon came out of retirement and won the Daytona 500. That's the most fun I'll ever have watching Brooks. AdoubleU24 and Turtle84 like this.